The Fork Fixture Kit is sold as a partial kit. Custom and harder to source parts are included, but you need to supply the rest. This helps to keep costs down. You can arrange the jig with the fork facing up or down. There is plenty of room for high rack forks either way, how you use it is up to you. 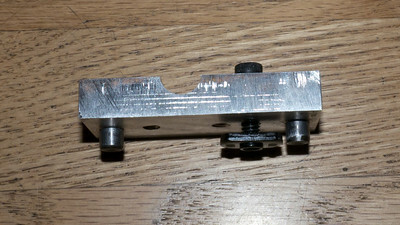 A piece of extrusion which acts as the V-block to hold the steerer. 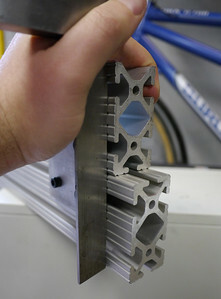 A piece of extrusion with a 1/2″ hole in it which acts as the fork blade support. 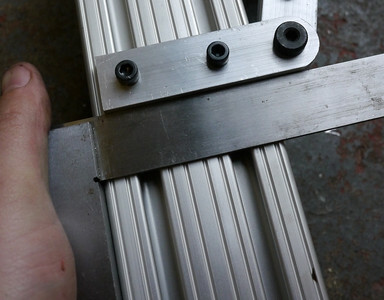 Pivot places for the fork blade support. 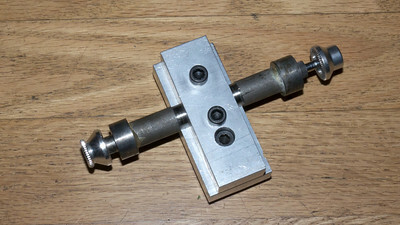 A 101B-style toggle clamp and a bracket to connect it to the V-block. 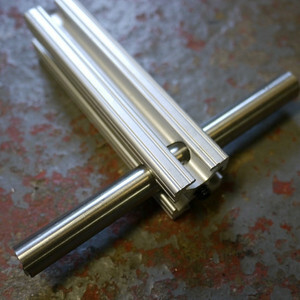 All parts are supplied in the raw machined form. You want want to deburr the sharp edges with a file or light sandpaper. 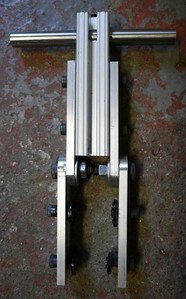 Note: There are two variations of the dummy axle holder. 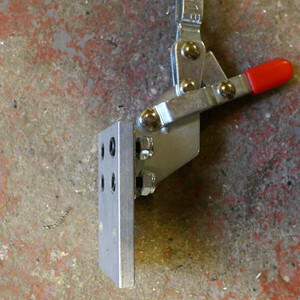 Early kits have a 2″ long version with a groove milled into the back. Most kits have a 3″ long version with two 8mm pins. Both versions work and perform identically, but you’ll see both used on this page. 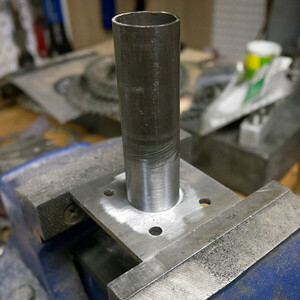 A 100mm front dummy axle (or make your own on a lathe, which is what I’ve done). 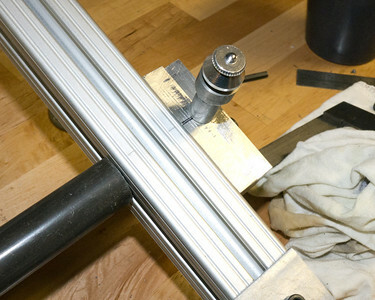 The dummy axle needs to have a 1/2″ diameter and 1.35″ long clamp section. You can use the “light” or “regular” extrusions from 80/20 for this project. This is what it looks like when you have all of the parts laid out together. 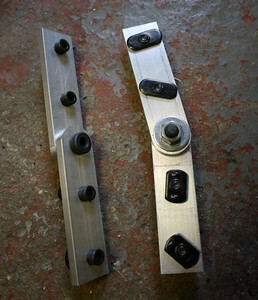 We’ll build the kit from the rear of the fixture to the front. It is important that these two parts are perfectly aligned. You can check for this with a straight edge. You can also look for gaps between the V-block and backbone. 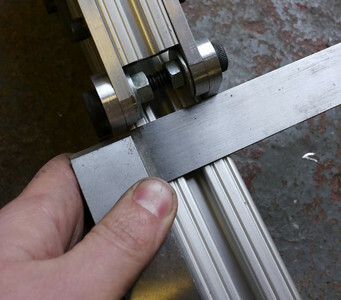 Carefully check both sides and make sure that your straight edge can’t rock between the extrusions. Put the 6″ 0.5″ rod through the fork blade support and secure with the set screw at the end of the support. 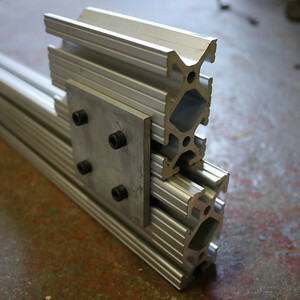 The rod and extrusion should be square to each other. 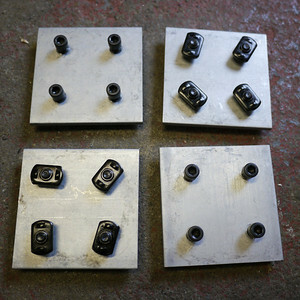 The pivot plates are partially assembled in the kit. You may want to disassemble them, oil the pivots, and deburr the holes. 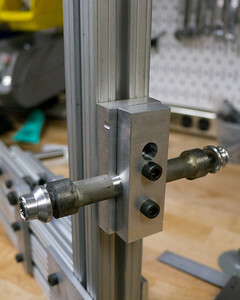 Then you should install 4 1/4-20×5/8″ bolts and T-Nuts through the remaining holes. 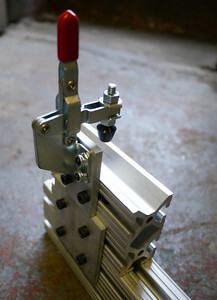 Attach the clamp plate to the upper slot on the V-block. 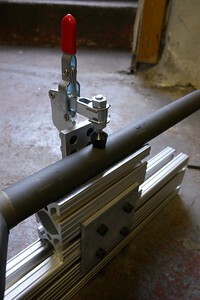 The pin on the toggle clamp can be used to adjust for different steerer tube sizes. 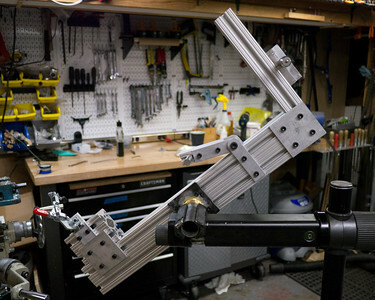 Make a clamping arm for your bicycle stand. 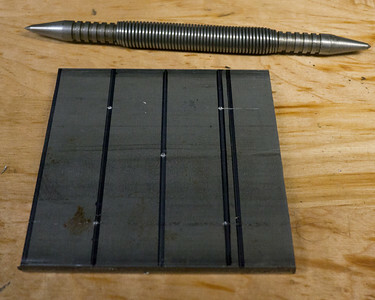 Get a piece of steel that is 3″ x 3″ and 3/16″ or 1/4″ thick. Drill 4 1/4″ holes 0.75″ from each edge (making a copy of one of the joining plates) and then drill a 1/4″ hole in the center with a hole saw. 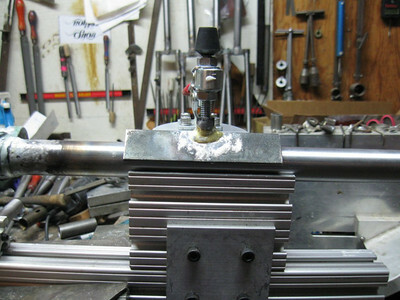 Braze a section of tubing to the plate and mount the plate to the center of the backbone. Don’t forget to measure twice, cut once. Two of my holes are off by 1/8″. It doesn’t really matter. 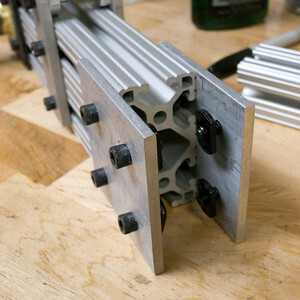 If you don’t have enough T-Nuts for the clamping arm you can get carriage bolts that fit into the extrusion slots at a hardware store. The slot is 5/16″ or 8mm wide. 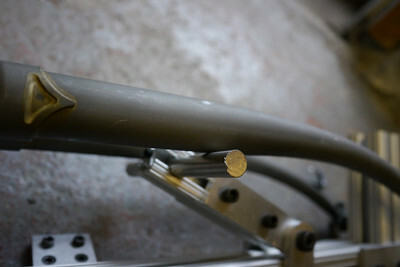 Mark the center lines of the steerer tube on the riser block to make it easy to measure fork offset. You can do this by putting a tube the same diameter as your steerer into the V-block and marking the top and bottom on the riser. 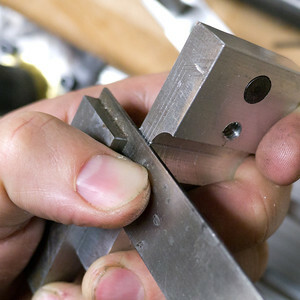 Measure to the center and scribe a line there for 0mm offset. My Name is Zulam from indonesia, is it possible to order from you? I am interested in your fork fixture and alignment gauge, please advise. Are you still selling these. Looks great, how does one purchase the kit? Secondly, is alignment gage available? What is the cost of the kit? 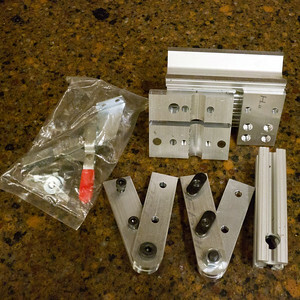 Do you have any of your fork jig kits for sale . I saw your blog referred on the velocipede salon forum and was wondering if you could provide more details. Are you selling just the kit? Is it unassembled? Do you have any experience with shipping to Toronto, Canada? 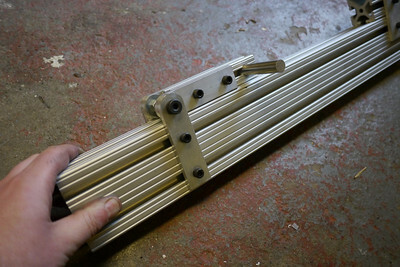 So, I”ve built a crappy fork Jig.. but would like to have an ok fork jig. The main issue that I have is that I”m improvising too much when it comes to holding the axle. I”ve been able to make everything else work with 8020 parts, but I don”t have any heavy machinery to make something like that at the moment. I know you”re not selling the kit anymore, but I figured I”d write to see if there was any chance that you had one of the axle holders still sitting around that you want to make some beer-money from. Hi there. I was thinking about making my own fixture and came across this site. Great info, thank you for sharing. Are these kits going to be available anytime soon? Sorry, I”m not making any more fork fixture kits. You are welcome to use features of the design in making your own. 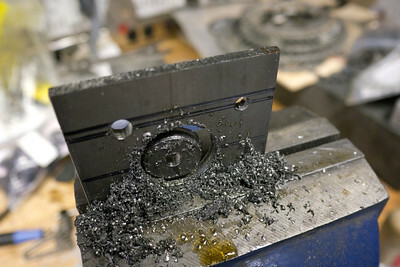 Hi Alex, I”m building a fork jig based on your design and I”m down to the last piece. 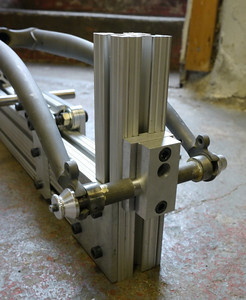 The dummy axle holder. would you happen to have any left I could buy off you? 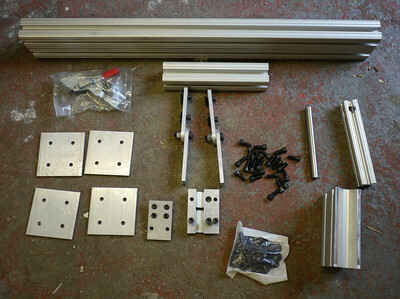 I”m ready to assemble the jig and thought I would give you a shot. Thanks for any info or help. -Tyler. 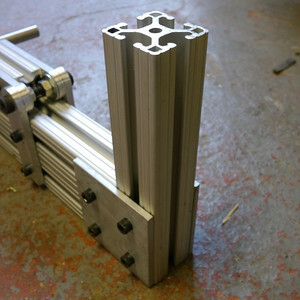 Hi, just wondering if you had any technical drawings of the machined pieces that could be taken to a local machine shop and cut? 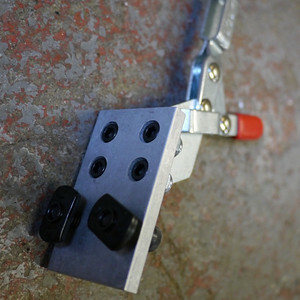 Most of the parts seem pretty easy to figure out and plan with a machinist, but if the drawings could be made available, that would make the process a little easier (I”m thinking particularly with the dummy axle holder). I wouldn”t even mind paying a few bucks for them if you weren”t willing to share them for free. Sorry, I don”t have useful drawings to share that exactly match what came with the kit. The drawings were done directly in my CAM software (CamBam) and don”t have dimensions that can be pulled out and don”t really visually match the final part.